Only weeks after the fall of the Berlin Wall on November 9, 1989, the people of East Berlin celebrated their first Christmas in freedom. So the LA-Berlin Sister City Committee decided to use their annual Christmas party in 2014 to celebrate the 25th Anniversary of the fall of the Berlin Wall. The event was hosted in the spectacular Tom Bradley Tower Room at LA City Hall generously provided by Tom LaBonge, council member and president of Sister Cities of LA, and his staff. About 95 guests attended the evening and enjoyed the spectacular views over the sea of lights of the city of Los Angeles. Numerous diplomats from Eastern European countries joined German Consul General Dr. Bernd Fischer and French Consul General Axel Cruaux as well as representatives of Villa Aurora, the German-American Business Association, the German-American School Association, and the German-American League in their celebration of this unforgettable historical event. 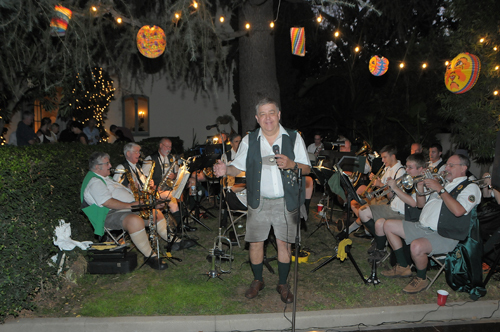 Tom LaBonge opened the celebration with a warm welcome, in which he referred to his German roots; and Rosemarie Reisch, president of the LA-Berlin SCC, elaborated on how the unification affected the sister city movement in general and especially the partnership between Los Angeles and Berlin. Consul General Dr. Bernd Fischer talked about the 25 years following November 9, 1989, a date that marked the end of the Cold War and changed the map of the world forever. After the official part of the evening, the guests mingled and enjoyed the festive atmosphere with a cocktail buffet and musical entertainment by renowned saxophonist/vocalist Reinhold Schwarzwald and guitarist Shea Welsh. An interesting and exciting evening that ended much too soon.